The history of Virginia and the evolution of its local governments are reflected in place names. 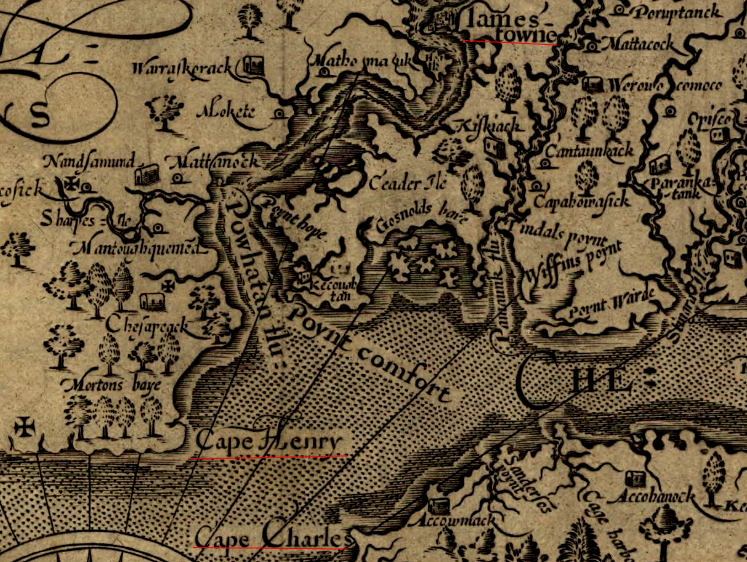 One of the first decisions of the settlers who arrived in Jamestown in 1607 was to name the points of land at the entrance to the Chesapeake Bay, and the modern names still commemorate the two sons of King James. Native Americans who lived in the area had already named the major river after their paramount chief, but the English replaced "Powhatan" with the name of their own king. Some Native American place names were retained. Words such as Chesapeake, Rappahannock, and Potomac were used long before the colonists arrived, and survive to this day. The names of local Native American towns were used for two of Virginia's first eight counties created in 1634. Accomac County is still on the map, but three years later Warrosquyoake County was renamed Isle of Wight County. The General Assembly created new counties as the population increased and expanded away from the capital at Jamestown, Williamsburg, and ultimately Richmond. The names of those counties reflect the politics of the time. Pittsylvania County was created at a time when Virginia was frustrated with how Great Britain was governing the colonies. In Parliament, William Pitt was championing a different policy, and proposed granting more authority to the colonies. The names of the counties just to the west indicate that reconciliation failed. Those two counties were named after Patrick Henry. There's a story behind the name and the timing of the creation of each county that is now part of Virginia. Scott County is named for the leader of the Yankee military that invaded Virginia in 1861 - but Virginia no longer has any county named for Thomas Jefferson and George Mason. They ended up in Kentucky and West Virginia, when those portions of Virginia became separate states. The county of Illinois disappeared after Virginia ceded the Northwest Territory to the Congress, initially as an incentive to get Maryland to sign the Articles of Confederation. Illinois County has since been carved up to create the tates of Ohio, Indiana, Illinois, Michigan, and Wisconsin.